NOAA's GOES East satellite captured a visible image of the latest tropical cyclone to form in the Eastern Atlantic Ocean. Tropical Depression 14E formed, despite battling northerly wind shear. 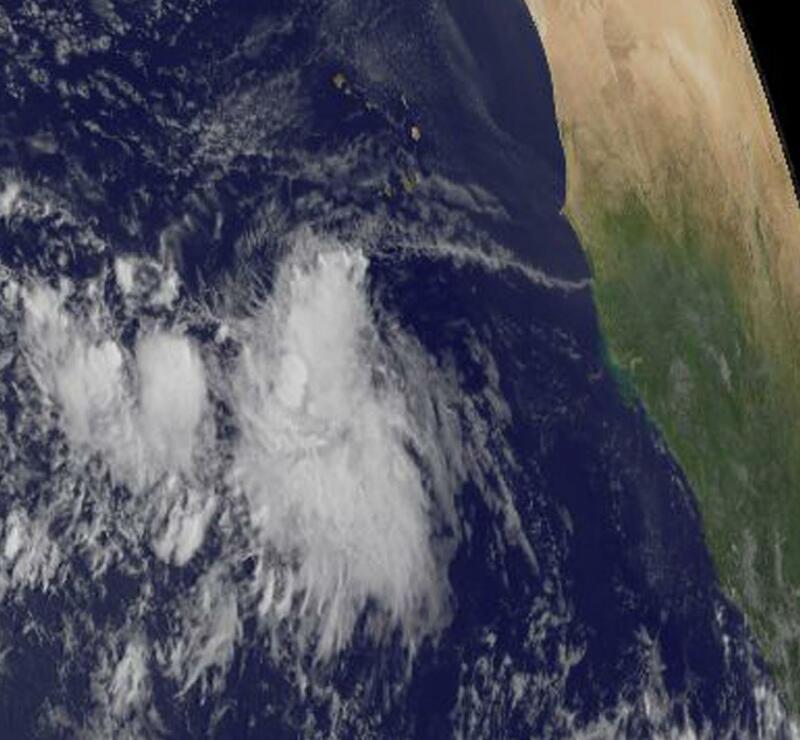 On Sept. 15, 2017 at 7:45 a.m. EDT (1145 UTC), NOAA's GOES East satellite captured this visible image of the Tropical Depression 14 off the coast of western Africa. The visible image showed curved bands of thunderstorms mostly south of the center. That's because the storm is being affected by northerly vertical wind shear, pushing clouds and storms away from the center. At 11 a.m. EDT (1500 UTC) the National Hurricane Center said the center of Tropical Depression Fourteen (TD14) was located near 11.4 degrees north latitude and 28.3 degrees west longitude. That's about 430 miles (690 km) southwest of the Cabo Verde Islands. The depression is moving toward the west-northwest near 10 mph (17 kph), and a west or west-northwest motion is forecast during the next couple of days. Maximum sustained winds are near 35 mph (55 kph) with higher gusts. The estimated minimum central pressure is 1008 millibars. The depression forecast to become a tropical storm later today. When it does become a tropical storm, it would be named Lee. For updates on Tropical Depression 14, visit: http://www.nhc.noaa.gov.